Once again, I apologize for the delay in posting. My laptop died and this time could not be revived. While it is out being diagnosed for potential repair, I spent the week convincing my 10-year old desktop to accept the software for my scanner and camera. After hours of persuasion, it finally accepted the challenge. I’m keeping my fingers crossed that it enjoys its new role and continues to chug along. Now that I’m finally up and running again, I can share my adventures in Door County, WI. My husband and I made the trek across the state of Wisconsin last weekend to attend a family reunion. I was excited to see family I haven’t seen in years, introduce Ryan to this beautiful area, and also to indulge in some of my favorite Door County treats. As with most gatherings, the weekend involved a lot of eating – from snacks to savory dinners to mouth-watering desserts. But my favorite part wasn’t just devouring the food, it was the conversations surrounding the dishes and sharing recipes for them. 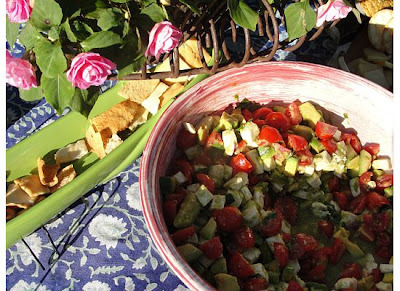 I’ve always enjoyed discovering new recipes, but since I’ve started this blog, I’ve come to truly appreciate the traditions, history and memories associated with each one. 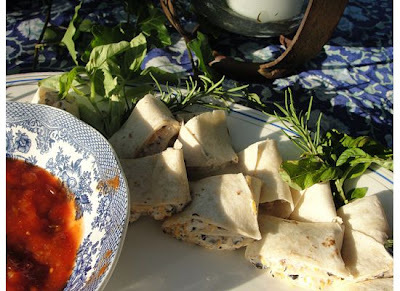 As I promised to pass along the recipes for the tortilla roll-up appetizer and tomato/avocado/mozzarella dip I brought, I mentally tagged each card with the faces of my family and the backdrop of the sun setting over the gently rolling lake in the background. Another recipe that was eagerly sought after was my aunt’s famous chocolate caramel brownies, one that I was lucky enough to inherit when I purchased this recipe box (the owner had a version very similar to the one my aunt uses). However, I did beg her for copies of her spaghetti sauce, beef & gravy, and mushroom noodle recipes. Every time my family travels to Door County, there is a stop we simply can’t pass up: Bea’s Ho-Made Products. Although they have a variety of pies, our favorite is the blueberry. We get one (or more) for everyone to share that weekend, then place an order to pick up pies on our way out of town to take home and enjoy later. I sadly haven’t been to Door County for many years and was wondering if Bea’s blueberry pie would be as good as I remembered or if during my years of absence, I had built up the memory in my mind into something divine and untouchable. But immediately upon placing the first bite in my mouth, I was assured my memory served me correctly and the pie was truly one of the best I had ever tasted. The Door County peninsula is famous for their cherries. Signs for cherry farms, cherry desserts or cherry jams and jellies are scattered all along the roads driving up and down the narrow strip of land. Unfortunately, Ryan and I never stopped to pick up a bunch. But when I got home, I knew I had to make a cherry recipe from the box in honor of our trip. The recipe I chose was Fresh Cherry Cobbler. 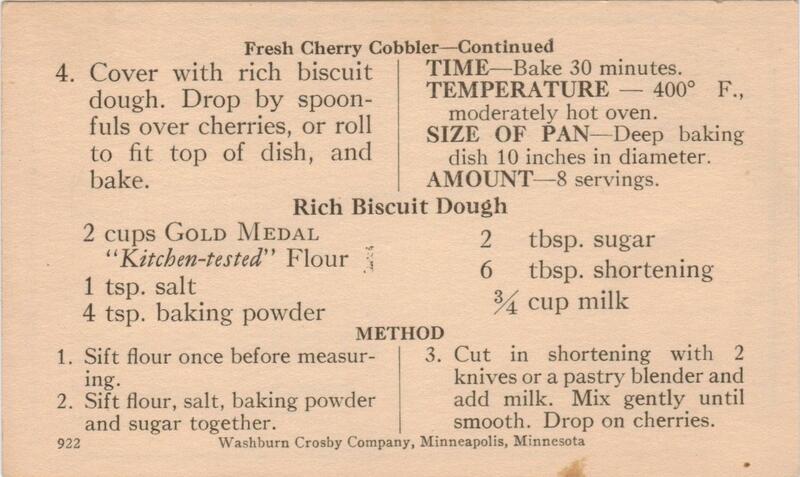 The most time consuming part of this entire recipe is pitting the cherries, but otherwise, it is quite simple to make. Once the cherries were pitted and cooked in a bath of water and sugar, I transferred them to the baking dish where butter and an unexpected ingredient were added: cinnamon. While the mixture cooled, I made the batter for the topping then dropped it over the cherries in spoonfuls. 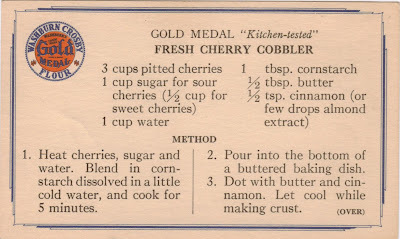 I wasn’t sure what the combination of cherry and cinnamon would taste like, but this cobbler is a wonderful treat for a summer afternoon. The cake-like topping drinks up the cherry liquid and each bite is complete with the wide range of flavors and textures. The dessert is great on its own, but you might want to try serving it with whipped cream or even vanilla ice cream just for an added treat. I hope that I will be able to travel to Door County again very soon. After spending several days staring at the expansive lake and rugged bluffs, I can’t believe I went so long without visiting one of my favorite vacation spots and seeing family that I love so much. When we were kids, my family used to stay with my aunt, uncle and cousins in their cabin up there at least once a summer. When it came time to leave, I always got that pang in my chest and my eyes welled up with tears; I was just never quite ready to leave. That feeling isn’t something you only experience as a child, it returned as my husband and I were making the rounds to say goodbye on our final day. But we vowed to return soon – for family, for fun, for relaxation and, of course, for blueberry pie. Maybe next time, we’ll break out of our routine and try something different. Perhaps even the pie Door County is famous for: cherry.